Discussion in 'Off Topic' started by Ginseng, Feb 4, 2019. I think this article has some good points. I disagree with them regarding their fidelity beliefs, but other than that I found it helpful. Does anyone else have anything to add about intimacy? I want to focus on being closer to others. I am not in a relationship and probably won’t be this late in life, but I would like to feel more connected to those I do have on my life. Y’alls thoughts? Interesting article. I think it misses the point that there is mostly a significant unconscious component to partner choice, and that often doesn't work out easily for people who are less than fully secure in themselves. Most people in other words. This article is addressing well resourced and fairly secure people I think. I also wonder what difference autistic functioning makes to the equation, I find it hard to put up with the downsides of live in relationships, and a lot of the time enjoy doing things alone, because it's more straightforward. It seems hard to have intimacy without oodles of socially complex activities being linked to it. Also I think I m simpler and more direct than many people, perhaps that translates as a lack of depth to some, or as unenjoyable. Hmmm, interesting comments. I personally do agree with the article or at least the way I interpreted it. I think intimacy can be sought and obtained not just in romantic relationships but in friendships and families. I liked the article because I thought it gave some helpful ways to follow to be intimate. I think it definitely takes mature people and people who are committed to the relationship. Treating each other with respect and being "safe" to be yourself. Autistics are known for our honesty, I think we need to work on connecting, or I do anyway because I desire this. Finding someone to practice connecting with is the problem. Maybe that should be a sad face. or But even without a romantic partner we have family we may want to be closer to. Listening and really hearing is a big part of intimacy. We have a lot to offer. I think there is someone for everyone. I wonder if it all boils down to trust? To love and be loved requires trust? Can hardly know everything there is to know about a person because they’re always going to change over time. not being afraid or worried about disagreeing or falling out. Finding a resolution and greater understanding of a person and the relationship can be gained through some conflict. These days, I'm with Woody Allen's movie - "Whatever works". I stopped pretending, that I can define and put in a box the human relationships. They are generally messy, egoistic, temporary, dishonest. Not that there aren't also good things... But you must take it, for what it is. Don't cling desperately into the idea of relationship, and that there is always a way to make it work... Most relationships are actually highly dysfunctional, they will never work and this is even worse then being alone. I wish people were a bit more honest, and had smaller expectations, work on their own mental health. This would increase the successful rate a lot. I kind of think trust and respect. We can love someone or be greatly infatuated by their “bad boy” or perhaps “bad girl” attitude but could we seriously be married to such a person? No, I think marriage requires maturity from both parties. Do we respect “bad boys?” I think it depends on our definition of respect. I hate hearing gang members talk about respect. They have no comprehension of the word. I really get angry just thinking about that. But being a Christian I try to follow God’s design in the Bible. The Bible says women are to respect their husbands. I think if we enter into marriage as women who do not truly respect our potential husbands (as in regards to accept and trust they can lead the family) the marriage will fail. My first husband was a pathological liar. My second husband could not control himself enough to be faithful. I cannot respect those things. I don’t think love is enough. I loved my second husband deeply, but I divorced him because I did not respect him. I have loved deeply, though not in a marriage relationship but I think true intimacy is connecting to another’s soul. This does not have to be a spouse. David said his soul was knit with Johnathon’s. This was certainly non-sexual. This post is not meant to be about Christianity. At this stage of my life I am seeking intimacy. I am just stating my beliefs regarding intimacy. But I want to hear y’all’s views. I know intimacy seems to be harder to achieve or more elusive for us. But I think most of us desire it. This is called "wishful thinking". I believe in intimacy. Sadly it is uncommon, but it does exist and even we can achieve it. Perhaps a key that has been over looked is character, unless that falls under maturity. Certainly commitment is necessary. We cannot achieve intimacy in a one night stand. I think we have to see each other through bad times and know we can count on them. We fall off a lot of horses in the mean time, but unless we get back on we can never ride. I love ❤️ ❤️ ❤️ it! Thanks! I think I will print that as a wall poster. I had to think about this a bit. Like most articles of this nature, it didn't really say anything substantial, just a lot of fluff. 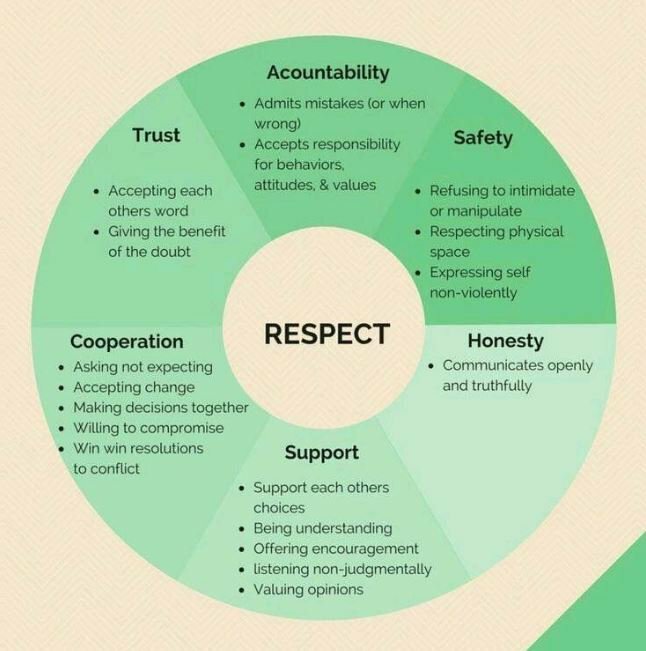 Like most people who replied, I think intimacy boils down to mutual respect, and Autistimatic's diagram summed up the requirements for respect nicely. Is intimacy possible without connectedness or bonding? I don't believe so. Bonding is necessary for intimacy, and those who are unable of unwilling to bond cannot achieve it. This aspect is not mentioned in the article. Respect and Trust matters definitely. To me those 2 things matter as much in a relationship as does physical intimacy.